(Nanowerk News) Scientists have used the Chandra X-ray Observatory to make a detailed study of an enormous cloud of hot gas enveloping two large, colliding galaxies. This unusually large reservoir of gas contains as much mass as 10 billion Suns, spans about 300,000 light years, and radiates at a temperature of more than 7 million degrees. 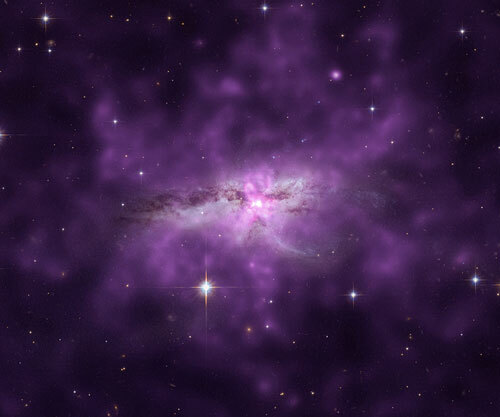 This unusually large reservoir of gas found in NGC 6240, a pair of colliding galaxies located about 330 million light years from Earth, contains as much mass as 10 billion Suns, spans about 300,000 light years, radiates at a temperature of more than 7 million degrees, and glows in X-rays (purple). The Chandra data have been combined with optical data from the Hubble, which show long tidal tails from the merging galaxies, extending to the right and bottom of the image. A paper describing these new results on NGC 6240 is available online ("The Exceptional Soft X-ray Halo of the Galaxy Merger NGC 6240") and appeared in the March 10, 2013 issue of The Astrophysical Journal.